Why Buy the DPI 611 Pressure Calibrator from Transcat? Calibration. Selection. Price. Transcat is a leading supplier of the GE'd Druck DPI 611 Series, and can offer 3-day accredited calibrations on new orders. Browse our complete selection of DPI 611 Pressure Calibrators below, or check out our comparison chart to ensure that we provide you with the very best product for your application. To request more information, technical support, get a quote, or place an order, feel free to call us, chat us, request a quote, or add to cart! The innovative design of the DPI 611 pressure system can only achieve efficient generation and precise control through the use of carefully selected materials with high tolerance machining and perfect finishes. The choice of case material and precision moulding ensures that the DPI 611 is both rugged and weatherproof. State-of-the-art analogue and digital microelectronics contribute both accuracy and processing power to provide a class leading pressure and electrical capability with a unique simple-to-use interface. With the DPI 611 you can generate from 95% vacuum to 20 bar/300 psi pneumatic pressure. A simple selector lets you convert from vacuum to pressure and with a few stokes of the pump, you will generate the required pressure. Fine adjustment is made with the built-in volume adjuster and falling calibration points are achieved with the precision vent valve. The redesigned mechanical system provides significantly improved performance, allowing you to generate 20 bar/300 psi while holding the instrument in one hand. It’s also quicker, taking just 30 seconds to generate maximum pressure even with a one metre hose connecting the device. Ergonomic design, a hand strap you can position on the left or right and a soft over-moulding provide you with a firm grip for hand-held use and prevent the instrument from sliding when on a test bench. The proven mechanical design provides a simple-to-use, dependable system without the pitfalls of electromechanical devices; namely, poor reliability, regular servicing, dependence on battery condition and long pressure cycle times. Using advanced silicon technology, the digitally corrected “Druck” pressure sensor achieves 0.0185% FS accuracy compared with 0.025% FS for the DPI 610/615. Taking stability and temperature errors into account over the one year calibration period, the DPI 611 is more than twice as accurate as its predecessor. This is expressed as a total uncertainty to give you complete confidence in the measurement accuracy between annual calibrations. The DPI 611 mA measurement accuracy includes one year stability, temperature errors and calibration uncertainty, making it three times more accurate than the DPI 610 series. For ease of use the electrical connectors have been rationalised to four 4mm sockets. The DPI 611 is truly a hand-held pressure calibrator, being 50% smaller and 33% lighter than the DPI 610. Redesign of the pressure assembly has resulted in a more efficient and higher performance system that is both smaller and lighter. State-of-the art microelectronics has reduced the size of the PCA (printed circuit assembly) and lowered the power consumption, which in turn means smaller batteries. Even though the instrument is much smaller, the touch display is almost twice as large for clear viewing and more information. All adaptors, hoses and accessories, including the dirt moisture trap, are quick and simple to fit. No tools or sealing are required and connections are leak free. Damaged adaptors are very simply replaced and there’s no repair downtime. Making leak tight connections wastes time and for several joints, it takes longer than a calibration. The DPI 611 system is proven to significantly reduce set-up time. The DPI 611 uses the same interface design as the unique and award-winning DPI 620 Genii (Measures magazine innovative product of 2014). The DASHBOARD allows quick application selection without menus or special keys - just tap the app. The TASK menu provides a library of popular configurations. From the calibrator screen three simple gestures completely reconfigure the DPI 611 for the next job. From the FAVOURITES menu it’s even quicker to access regularly used and customised TASKS. The DPI 611 touch screen only shows function keys when they’re required, making it quicker and simpler to use than complex keypads with special function keys and key combinations. The DPI 611 is a simple-to-use “everyday” tool for maintaining and calibrating pressure instruments. It also has the advanced features of the DPI 620 Genii for automating calibration procedures, calculating errors and interfacing with PCs and calibration and maintenance systems. Procedures generated by calibration management software can be downloaded to the DPI 611. These procedures are presented as a list of work orders and when selected, each one will configure the DPI 611 to calibrate a specific device. The procedures run automatically and all you have to do is set the pressure. The data is recorded digitally ready to be uploaded to the management software. Using the DPI 611 with automated procedures significantly reduces the time taken to calibrate a device, from typically 40 minutes to less than 10 minutes including the time to set-up. Further time is saved when assessing the data and creating calibration reports because these operations are automated within the software. Error analysis calculates the error of the device being tested and reports a pass or fail. The error is displayed live allowing zero and span adjustments to be assessed as they are made. The DPI 611 can record data from three channels simultaneously by manually touching a record button or automatically at a user set interval. Data can be reviewed on screen or the data file can be transferred to a PC for further analysis. The DPI 611 integrates with leading calibration and maintenance software including 4Sight from GE. Typically such applications provide an automated and paperless solution to calibration and realise significant benefits including reduced operating costs, regulatory compliance and improved process efficiency. 4Sight is the new state-of-the-art, integrated, web-based Software as a Service (SaaS) calibration manager. 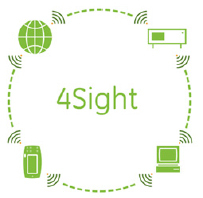 4Sight calibration and maintenance software gives you total control for all your calibration and maintenance tasks. 4Sight calibration management software will help you comply with regulations, reduce running costs and improve process efficiency. As your calibration manager, its automated workflow, robust data and complete traceability will significantly reduce calibration and maintenance costs. Please visit http://www.ge-mcs.com/4sight for more information. % step: The step size is defined as a percentage. For example 25% provides five test points of 4, 8, 12, 16 and 20 mA. Defined step: The step size is defined as a value in mA. Span check: Toggles between two end points, for example, 4 and 20 mA for checking zero and FS. 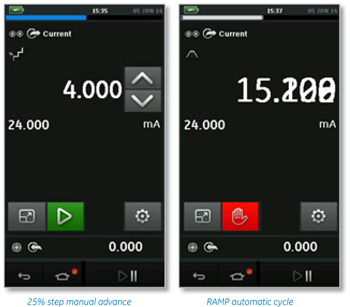 Ramp: A linear ramp between two end points with programmable travel and dwell times is perfect for dynamically testing switches. Nudge: Simply used to make a small incremental change to a mA output using up/down keys. This is great for determining trip values. Switch test: Automates the capture of pressure switch actuation and de-actuation values and calculates the hysteresis. Max/min: Captures maximum and minimum values and calculates the mean. Relief valve: Captures the venting pressure of a relief valve. Scaling: Scales the measured value into a process value. For example, mA expressed as a %. Flow correction is available for scaling differential flow transmitter outputs. Pressure Resolution: Adjustable from four to seven digits; this matches the displayed value to that of the test device for easy comparison. Help: The DPI 611 is provided with a multi-lingual quick user guide to get you up and running without delay. For convenience, the full manual is stored digitally within the instrument and can be transferred to a PC for viewing or printing. In the help application you can also view wiring connection diagrams. For 30 years the DPI 600 series has been the benchmark for accuracy and pressure generation, and today the DPI 610 is the industry standard simply referred to as the “Druck”. The new DPI 611 builds on this legacy to provide a highly dependable, quick and simple solution to streamline your pressure maintenance and calibration routines. Calibration Labels-Green, Self-Laminating, 1 3/4x5/8"